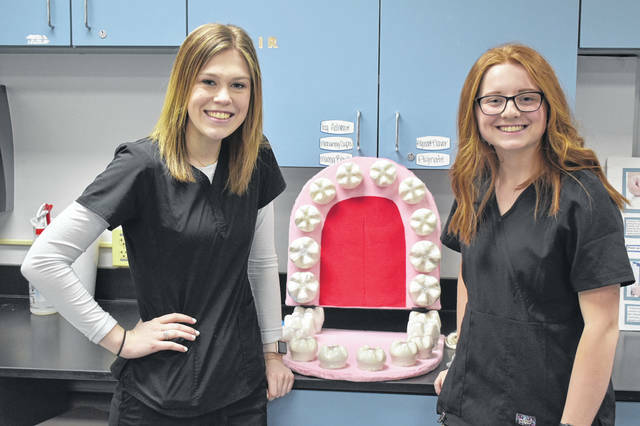 DACC Dental Assisting students Abby Baker, left, and Allie Holdcroft, right, pose next to a model of a mouth they made to teach elementary school students how to effectively floss. The pair said they’ve done at least 10 presentations about dental hygiene at elementary schools, and they want to raise awareness of how important oral health is. Two high school seniors in the Delaware Area Career Center’s Dental Assisting Program recently won first place at the HOSA-Future Health Professionals regional competition and are headed to a state competition. Abby Baker and Allie Holdcroft took home top honors in the regional competition in December, and on Tuesday, the pair said they are getting ready for the state competition to be held April 9-10. The pair are competing in the community awareness category, which meant they needed to complete awareness projects and partner with an organization to plan or run an event. To fulfill their requirements, the pair decided to promote dental hygiene at every step of the competition. “We really wanted to pick a competition that we could study, master, and then go in and show the judges that we know what we’re talking about,” said Baker, an Olentangy High School senior. The pair reported they did at least 10 presentations about dental hygiene in elementary schools, complete with giant teeth to show kids how to correctly floss. Baker said they’ve been stressing dental hygiene at other events as well, including a partnership with Common Ground Free Store and the Alpha Group, a local nonprofit aimed at helping individuals with disabilities. “We picked how your oral health affects your physical health,” Baker said. “When you really start to get the gravity of (dental hygiene) and really start to understand that it’s going to cause problems with your heart, your liver, your kidney, and things like that, it’s really cool to take the knowledge, learn about it, and tell everyone else,” Baker said. Holdcroft, a senior at Olentangy Orange High School, said the pair also created an Instagram account to help spread positive dental hygiene in a modern way and in a way that reaches outside the immediate area. Holdcroft said their account — @dental_awareness2018 — has gained over 1,000 followers and helped them professionally network. “We’ve gained a lot of connections and made them aware of our topic and school,” Holdcroft said. Ironically, neither Baker or Holdcroft plan to make a career in the dental field. Instead, they both want to study education, with Holdcroft adding she’d specifically like to work with special needs students. Holdcroft said she’s excited to be partnering with the Alpha Group to help put on its Casino Night on March 15 and work with them on other projects. Baker said they’ve gained public speaking and education skills by working on the project, and they are thankful for the support they’ve received.